Please allow me, for just a moment, to gush over this book . First of all, the sweater on the cover. And don't even try to tell me that you don't judge knitting/craft books by their covers. We all know you do it, it's okay to admit it. Anyway, the fetching sweater on the cover is called the Adelaide Yoke Pullover. If you've ever wandered into a yarn store there is no doubt that you've seen a yoke sweater and if you're anything like me, you've dreamed of making one. The Adelaide is an updated version of the classic yoke sweater. It has been designed to have a more flattering fit and soft colors while maintaining the traditional fair Isle patterning. As blog is my witness, 2011 will be the year of the yoke sweater for me, and I will be using this pattern. The idea of taking a traditional method and modernizing it is what Courtney and Kate's new book Vintage Modern Knits: Contemporary Designs Using Classic Techniques is all about. While the two authors come from different knitting backgrounds, they share a love for vintage styles and the different techniques found in knitting. In the introduction of the book, Courtney and Kate explain that "each project has its roots in a particular style or technique that has been updated for a modern application and aesthetic." And as I flipped through the projects, I quickly learned that with each design there is a bit of history to be learned, and a new method to master. So, to briefly recap: Vintage designs featuring traditional techniques that you use to make handmade knits with modern flair. Um, sold? I mean, what's not to love about this book is what I would like to know. 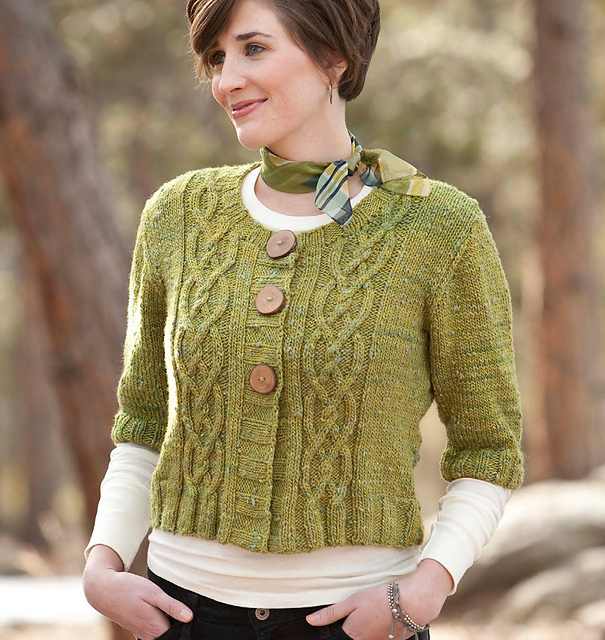 Brigid Jacket—how cute is this take on a traditional Aran cardigans? I am fairly convinced I would be much nicer if I were wearing the Whitby Stockings right now. These are cute enough for me to give up my sock knitting boycott. Yvette Roositud Hat—Roositude is an "Estonian inlay technique" that looks similar to embroidery. I can't wait to learn this technique so that I can incorporate it into other knits. Yangtze Cardigan—the 1950s cardigan of my dreams. In mustard yellow, please. So, enough gushing already! 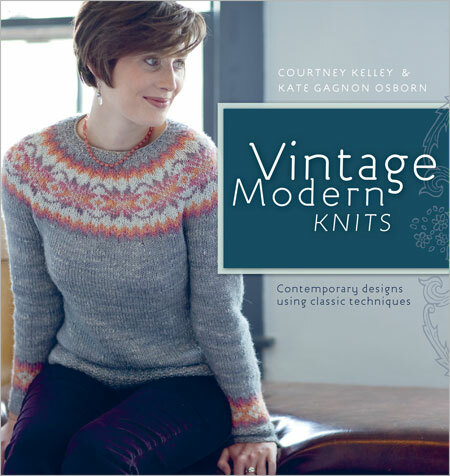 Do you want to win your very own copy of Vintage Modern Knits: Contemporary Designs Using Classic Techniques ? Well you can! It's easy! 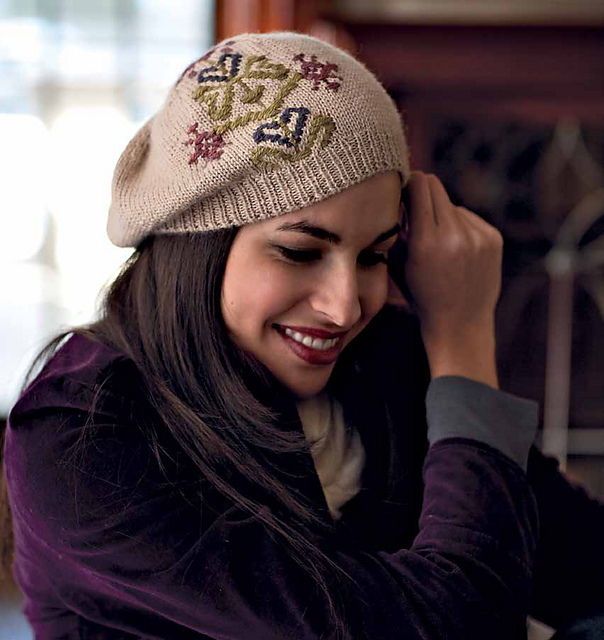 The kind folks at Interweave are offering a copy of Vintage Modern Knits to one lucky Narrating Life reader. Please leave a comment on this post: Do you judge books by their covers? You can be honest. Make sure I have an email address linked to your comment so I can reach you. Spread the good word!Tweet, blog, facebook, (or whatever social media-type-thingie you're obsessed with) about this giveaway and link back to this post for an extra entry! Please leave an additional comment for each additional entry. Want to hear more praise for Vintage Modern Knits? Check out past and present stops on the blog tour here! Marilyn, please email me ASAP to claim your book! I judge all books by their cover. Multiple editions of books will be judged differently. Wow I am a cover judger myself if I dont like the cover I really feel I wont like what is inside and thus wont by it...guilty I know... wow this book is beautiful....if only I could be so lucky to have this beside me and giving me such beautiful inspiration for gift making this season...I would love love this and be so appreciative...! I totally do. Would love to try this one out! of course i judge a book by its cover. especially if it is a book that involves any kind of design. how can i trust their design if they don't even know how to design a cover? love these sweaters! Uh, yeah. I TOTALLY judge books by their covers. And have often been disappointed, as a result (note to self: stop doing that). Elizabeth Zimmermann's books are very good examples, speaking of knitting books. They're not much to look at but holy cow, slap me in the face and call me Sally. The woman is a genius. Especially in the seamless yoke and fair isle sweater department, nudge nudge. Also: why can't books written for women have nice, plain, graphically-interesting covers? Why must they look like they're wrapped in lace and dipped in a pink dye bath? Or like a soap opera add? Even the non-romance books look like that and it drives me bananas. i also judge books but the cover and am so happy that this one lives up to the gorgeous photo on the front. Oops, I was signed in to the wrong account up there. It's dw. I'd love to win this book, lovely patterns! I have been sucked into many a book simply from the cover, especially knitting books. On the other hand, they can be a complete turnoff. But then Barbara Walkers books aren't anything fancy, based on the cover, and we all know what hidden inside those gems! I wanna win! Pick me pick me!!! I totally judge books by the cover, but I push past it to actually get to know the person, oh wait, are we talkibg about books?!?! That's tough to say. If it's all about a type or style of garment I have no interest in, like "Frilly, Sissy, Girly GewGaws To Knit", then yes, I'd pass. But if is "100 Hats" I'm going to look thru it, even if I don't like the 99 pictured on the cover. You never know, that last one might be a gem! Thanks for the giveaway. Yes, I judge books by their covers, but I'm willing to forgive bad cover design for certain genres. This book looks fantastic. Now I want to knit the cover sweater too! I JUST hopped on the knitting train so I'd really like to get more involved. I hate to admit it, I do judge books by their covers (and titles). Would love to see if the inside of this book lives up to the cover. I'm a total cover-judger when it comes to books. With fiction books, I've been proven wrong in my judgment (hello, Ride the Wind) but with books like this? Um, cover (and text) design is key. And you know, if I don't win this giveaway, I put the book on my Amazon wishlist so that everyone will know I want it. Sadly yes, but if there's enough that piques my interest, such as the title, or if it was recommended to me, I will read a synopsis and reviews before coming to a conclusion. I certainly do! I love that yoke cardigan, too. I have yet to make myself a sweater, but this year may be the year for me, too. Oh, I'm terrible. I buy books by their cover, wine by their label, etc. I sure would love this book. When it comes to knitting books I am all about judging by the cover. Other types/genres I tend to read the blurb regardless of how good or bad the cover may be. I totally judge books by their covers! And I love the sweater on the cover of this book - in fact I've been eyeing this book and would love to win a copy! Yep, the cover totally matters, but I have been surprised in the past! I cannot wait to see this book in real life! I also Facebooked it up. I think some of my knitting friends will be all over this. Yes, I sometimes do judge a book by its cover, and based on this cover, this book looks fab! I also sent a link to this blog, so here's my 2nd entry. BTW, don't know what happened in my link above... the comment above (with the long string of characters) is mine also. I usually judge a knitting book by it's cover but I have been surprised by hidden gems inside so many times that I always look through just to see if I'm right or not ! I absolutely judge books - especially knitting books - by their covers! It's hard not to see a fabulous knitted item and say that must be a terrific book! This book really looks like a terrific knitting book and I so want to knit the cover sweater! I do judge books by their covers. I also judge books by their publication date. Reading something recently released is more appealing to me. Yep, totally judge books by their covers. It's not foolproof, of course, but I can't seem to help myself. I'm a sucker for packaging. Those cardigans are pretty much to die for. I frequently judge books by their cover, especially in run-down used book stores with poor filing systems. And I would love a copy of this book, the cover looks awesome. A good cover will attract my attention and a title will determine whether I open a book, but both must accurately depict what's inside or it turns me away... I don't like to be mislead. Lots of fluff doesn't draw me in... I want to really see what I'm getting and not deceived by lighting and settings. Kate & Courtney have done a great job here... this one definitely intriques me. I tweeted but I can't figure out how to get a link to the tweet . . . I judge books by their cover; that's what they're there for, right? I really do. Unless I know exactly what I'm going for, then I don't care. Yes what's on the cover of a book is the hook to get me to look inside. This looks like a great collection of patterns and I would love to win a copy! It depends on which type of book we're talking about. Sometimes a really ugly cover hides a wonderful book, and vice versa! I generally don't judge books by their covers (it's failed too many times for me, and I often order books from the library without having seen the cover), but I have to admit a tendency to do so with craft books to some extent. Great question! I am definitely a cover judger. In fact if a book has a cover that I deem "ugly" I actually won't read the book! Even if it's an otherwise good book. I will check it out from the library, take it home, carry it around, etc. but I usually won't actually read more than a few pages if I don't like the cover. Yes and no; but I think it is human nature. I have been fooled by this and that is why I try not to. And I posted a link to this giveaway on my blog! I certainly judge craft books by their covers, and this one is so perfect. I love that the colorwork is done in a nubby yarn like Terra - really unusual and modern. I've never knit a whole garment in Terra, but now's the time! I like to browse books and do judge them partially by their covers - but then I always want to delve inside as well...thanks for the giveaway - it is quite generous...cheers! Of course I judge a book by its cover! When it's as attractive as this one, at least. It doesn't last beyond opening the book, but it does make me open it.. I don't usually judge by the cover, but it sure is bait to see what goodness i might find within! I do a fair bit of cover judging. But I try to keep an open mind. I love the hat and the stockings! I don't usually judge a book by its cover, at least not negatively. Bad covers aren't necessarily indications that the contents are bad, but really good covers often mean really good text inside. Or so I've come to believe. I learned long ago not to judge a book by its cover. I always flip through books before I put down the cash to buy them. This goes both ways though. Sometimes I see a magazine or book that has a very "blah" photo on the front but totally gorgeous projects inside. This book is wonderful! Yay to Kate! I am so proud of you! You are my inspiration! These projects look great! Hope I win. Of course I judge a book by it's cover, don't we all. Would love to win the book cause otherwise I have to buy it cause I just have to have the stockings!!! I judge books by their covers but I blame it on the fact that I work in book publishing...but I did it before I started working so its not actually true. I love the Whitby Stockings, if those were on the cover I would have picked this book up immediately...but I also would have assumed it was a sock book. I think they did a good job with the cover, and everything I've seen of the inside too! Oh! and I posted this on pinterest too! I judge crafty-type books by their covers for sure--good photos really draw me in, and bad ones send me running!